“Last month, clemency advocates including Amy Povah of CAN-DO Clemency and Alveda King, the anti-abortion evangelical leader, hosted a panel at a Women for Trump event at Trump International Hotel in Washington. 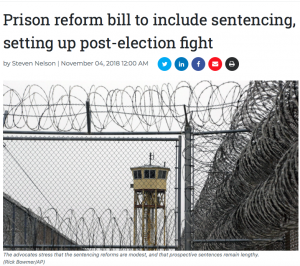 Povah hopes that Congress passes the legislation, and that Trump will supplement the reform with generous use of his constitutional pardon powers. Last month, Trump said “a lot of people” are jailed for year for “no reason” and that he was actively looking to release some. Povah said clemency would be particularly appreciated around the holidays, including Thanksgiving, when presidents pardon turkeys, disillusioning people in prison. “I have missed 31 years of Thanksgiving and Christmas holidays with my family. I’ve watched myself age in the mirror and my greatest fear is that the gatekeeper to my freedom will never see me as the man I am today instead of the man who engaged in a 1980 nonviolent drug offense,” he said. Another inmate advocated for by Povah, Lavonne Roach, who is 21 years into a 30-year methamphetamine sentence, said that she hopes Trump will be moved to release her as well. Her daughter is raising children on her own because her husband is deployed to Afghanistan. “Every day I pray that a miracle will enable me to help her with the kids. Just to be there for her and the babies would be a dream come true and the end of a very long nightmare,” Roach said. 46 queries in 0.184 seconds.